Find free acne tips and answers to the most commonly asked questions about acne! 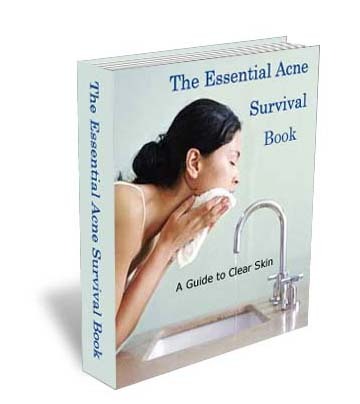 If you’re looking for an all-in-one resource for acne-prone skin, get The Essential Acne Survival Book. This book is a compilation of answers to my visitors’ most commonly asked questions and concerns. I personally researched and wrote it for others to save time and to have accurate information. Best of all it is ABSOLUTELY FREE! What every acne sufferer should know—Understand acne and its causes, and get informed about your treatment options. Learn how to choose the right treatment according to your skin type. You don’t have to put up with this condition! Skincare tips for acne prone skin – ground rules that you need to follow before even considering an acne treatment. This includes important shaving instructions for men. Emergency quick fix for flare ups – a little known secret that will save you from pimple grief on important days like your graduation, first date or job interview. 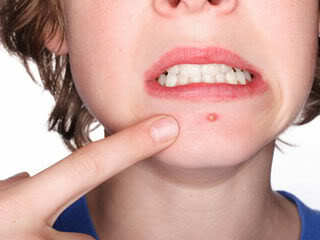 How to pop a pimple – follow these instructions to avoid scarring or more acne. Guide to removing whiteheads and blackheads – avoid common mistakes that only lead to more blackheads! Learn the right way to eliminate them once and for all. Concealing acne like a pro – tricks of the trade! Learn what foundation is best for acne-prone skin and how to camouflage pimples like a makeup professional. Options to treat acne scars – types of scars and what you can do about them. Acne Weapon Newsletter – a free subscription to my newsletter, which is filled with helpful, quality researched information about acne treatments, and answers to frequently asked questions, delivered periodically to your email inbox. I do the research for you! After completing the form below, you will receive an email asking you to confirm the address given just to be sure someone did not submit your email address without your knowledge. Upon confirmation, you will receive a link to download the ebook. Sign up here to receive The Essential Acne Survival Book and my monthly newsletter The Acne Weapon. I promise to use it only to send you The Acne Weapon.